Badal malayalam movie written and directed by G Ajayan will have Liyona Lishoy as and Mary Grace in lead. The movie discusses the social issues faced by the landless tribal people in India. Produced by Act A Centere For Theatre and St Jude Media Pvt Ltd, 'Badal' will be blessed with the presence of Salim Kumar, Sajitha Madathil, Sunil Sukhada, Anoop Chandran,Siraj Muhammed, Rajesh Sharma and Manjulan. G Ajayan much known as a theatre artist is gearing up to make his own space in the malayalam film industry. After proving his mettle as an actor through stage shows, Ajayan is looking forward for his directorial venture 'Badal', a movie which discusses the social issues faced by the landless tribal people in India. The movie pools into the life of Saina Vahab Muhammed, a journalist by profession and Kani who belongs to Muduka tribal group. Their unique friendship takes the story to the next phase which would keep the viewers intact. Liyona Lishoy would give life to Saina Vahab Muhammed while Mary Grace will don the role of Kani. Mary Grace who shot to fame through her performance in 'Matsyagandhi', a play directed by Ajayan is looking forward for her big screen debut. 'Badal' would give an opportunity for 60 popular theatre artists to act in the movie. The shooting of the movie provided an opportunity for many big screen artists with theatre background to work together. Produced by Act A Centre For Theatre and St Jude Media Pvt Ltd, 'Badal' will be blessed with the presence of Salim Kumar, Sajitha Madathil, Sunil Sukhada, Anoop Chandran,Siraj Muhammed, Rajesh Sharma and Manjulan. The camera of 'Badal' was handled by Jerald Rajamanikyam. For the lyrics of Rafeeq Ahammed and Engadiyoor Chandrashekaran, the music has been handled by Biji Pal. 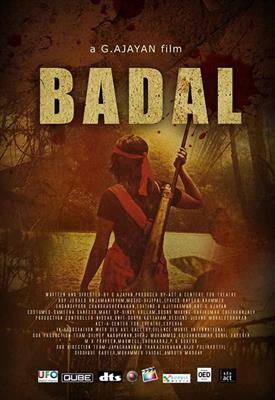 'Badal' which travels through the life of the tribal people would be visual treat for movie lovers who wish to get the merit of their time invested. The movie is being produced under the banner Pure Touch Film Company. With a long line of movies under work ready for release, the coming year would do more wonders. After the final cut, the movie is expected to reach theatres in January 2014.